The mission of ​Dhamma Sukha Meditation Center is to research, practice, preserve and teach original Buddhist teachings and meditation as found in the earliest Buddhist texts to ease suffering and promote peace in this world. Retreats are small and conducted largely in silence however, mindful speech is encouraged during the evening Dhamma talks. Participants are requested to observe eight precepts that comprise a code of conduct as a foundation for meditation practice. 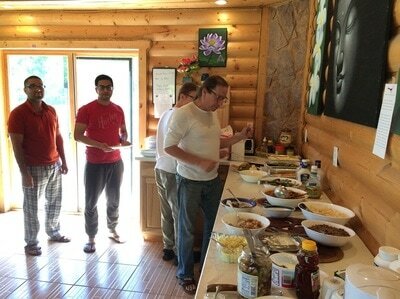 Breakfast and lunch are the two meals offered buffet style each day. Rrefrigerated food storage is available to those with special dietary needs. 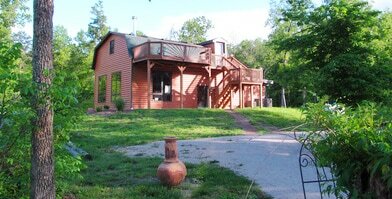 Contact the retreat manager if you have a medical need to bring supplemental foods for your private consumption. Tea and fruit juices will be available everyday around 5:30 PM before each evening Dhamma talk. Food or snakes are not permitted in the bedrooms or meditation hall. After you register, the retreat manager will contact you to arrange arrival and departure itinerary and ground transportation. ​First complete and submit the Contact Form. Temperatures and weather in Missouri can be unpredictable. Check Here for the local forecast and prepare accordingly. Bring comfortable but modest loose fitting clothes that facilitate sitting and walking meditation. Sweat pants and easy slip-on/off shoes are recommended. Bring clothing that can be layered should the weather turn unexpectedly warm or colder than normal. It is advisable to bring a knit cap and gloves just in case the weather turn cold. Sweaters or jackets are generally needed at night. ​(zafu) with mats (zabuton) will be provided by the Center. You are welcome to bring any kind of meditation bench, pillows or mat that will make your meditation experience comfortable. Bed linens, blankets, and towels are provided. Bring a special personal pillow or blanket if desired. Bring personal toiletries (toothpaste, bath soap, sunscreen, Kleenex, etc), insect repellant, flashlight or headlamp and extra batteries, an alarm clock or watch with an alarm, and a water bottle to be filled at the center with filtered water as needed. Do not bring valuables, nonprescription drugs or alcohol. Avoid using scented cosmetics or perfumes that may be allergenic to others. Reading and writing are discouraged during this training period, except during the evening dhamma talks by Bhante. Candles, incense, and smoking are not allowed in any rooms. Please be punctual for all group events. Turn sound off clocks and watches. There is no public phone on the facility. Cell phones will be collected at the beginning of the retreat and made available during breakfast on the closing day of the retreat. Computers and notebooks are prohibited during the retreat. Safe and secure storage for personal computers and cell phones will be provided. ​Bhante is a distinguished American Buddhist monk with more than 40 years of meditation practice. He is the author of The Anapanasati Sutta: A Guide to Tranquil Wisdom Meditation, Breath of Love, and Moving Dhamma Volume 1. and other books. Bhante is the American representative to the World Buddhist Summits and Conferences. 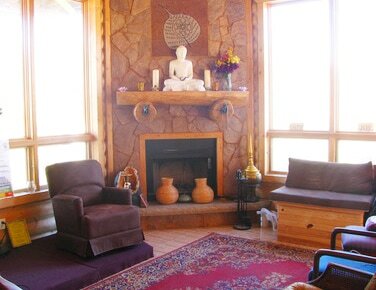 Participants are required to be present and seated in the meditation hall for the 5:30 AM and 6:00 PM sessions. A daily 10-minute teacher interview will be scheduled for each person. During practice periods, participants will balance sitting and walking meditation as suggested by the teacher Indoor and outdoor meditation practice is encouraged throughout the retreat.